Have you ever thought, “If I could just turn this into a GAME, my kid would learn it no problem.” Kids are like that, aren’t they? Ask them to clean their rooms and they’ll fall on the floor at the injustice of it all. 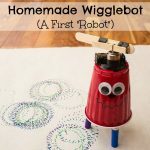 Turn it into a game and they’ll be transformed into little cleaning machines. 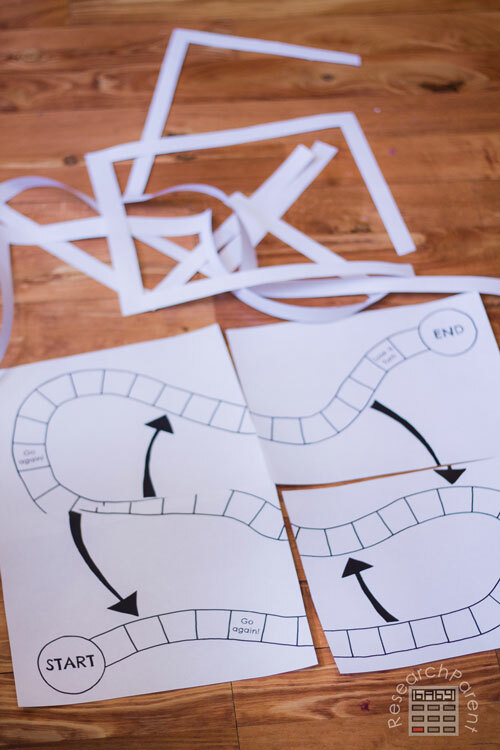 (Sorry, this game board will not help your kids clean their rooms.) I’ve been wanting to make a generic, re-usable, board game for awhile now. I have definite plans for what I want to do with it. (Stay tuned for some upcoming math games.) 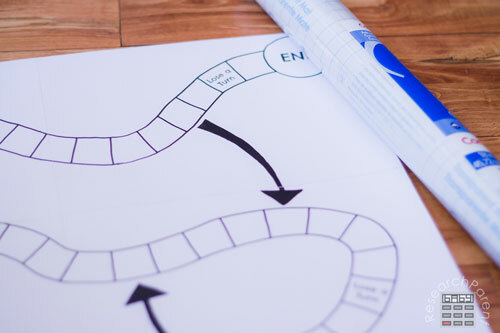 However, if you have your own ideas, this free, printable, hand drawn, game board will work just as well. I’ve spent a lot of time making free cards that kids can match to learn different subject areas. I have plans to make a lot more. Since the cards each contain little bits of information or images that need to be matched to a specific term, they make great clues for a trivia style game. Since I just finished this game board yesterday, so far we’ve only tried it out once, but I have to say my trial went remarkably well. I think even my husband, who is a skeptic by nature, was impressed. Since my oldest studied Ancient history over a year ago and will be studying the Middle Ages this fall, I decided to use the board game as an opportunity to review Ancient Rome. 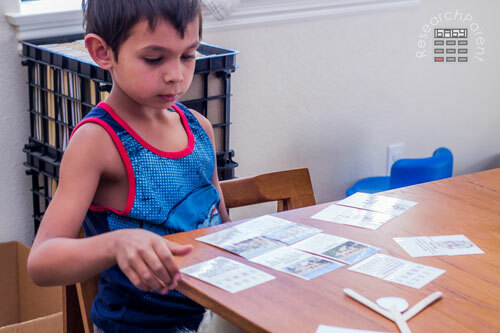 To prepare to play the game, I let him review the terms from our Ancient Rome Definition set. As always, we first talked about the control cards together, then I gave him a set of split cards. He matched the clues (in this case the picture) to the term. After he thought he had all the right pairs, he checked his answers himself with the control cards. When I said we were going to play a game, my 5 year old immediately wanted to play too. I decided to reduce the number of vocab words to 10 (Romulus & Remus, Tiber, forum, toga, patrician, plebian, Roman numeral, gladiator, barbarian, and aqueduct) and let her quickly have a chance to match the words to the pictures and check her answers. Once we started playing, the 3 year old wanted to get in on the action too. They each chose a game piece, then whoever’s turn it was would draw a picture card. If they could name what the picture represented, they got to roll the dice and move (hoping to land on a shortcut or “go again” space and not a go back or “lose a turn” space). Since it wasn’t really a level playing field, I gave my 5 year old hints as needed. (“It sounds like tiger.”, “Remember in Harry Potter, when Hermione said wizard’s chess was totally barbaric?”). Most of the time I would just tell my 3 year old what to say and have him repeat it. By the end of the game, I think they all gained a lot more familiarity with the terms and my 7 year old in particular now has them completely memorized. 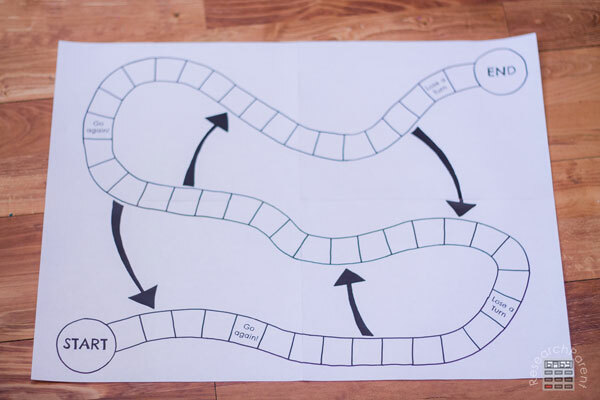 I should also point out that while I planned for the game board to be made of 4 taped-together pages, I also made a shrunken version that fits on one page. 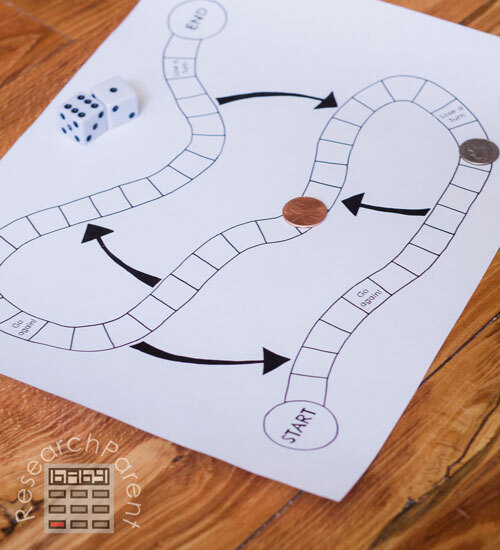 This would be handy for a quick game where you didn’t want to save the board. Coins work pretty well as the game pieces. 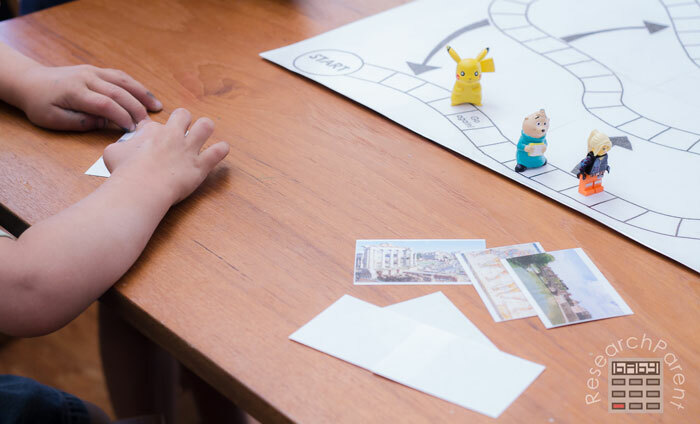 Although I didn’t, it might be fun to have the kids decorate the game board by drawing on it or using stickers. If you were playing with older children, you could also use the written clues (either alone or mixed in with the picture clues). We might try this next time with me reading the clues to my non-reading children. Or you could not use clues at all and just use the board to kill some time in a restaurant. 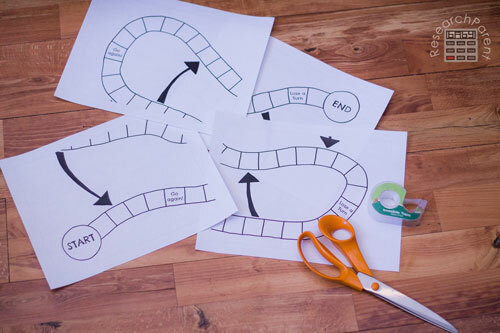 Cost: Free printable, less than $1 to mount and laminate. 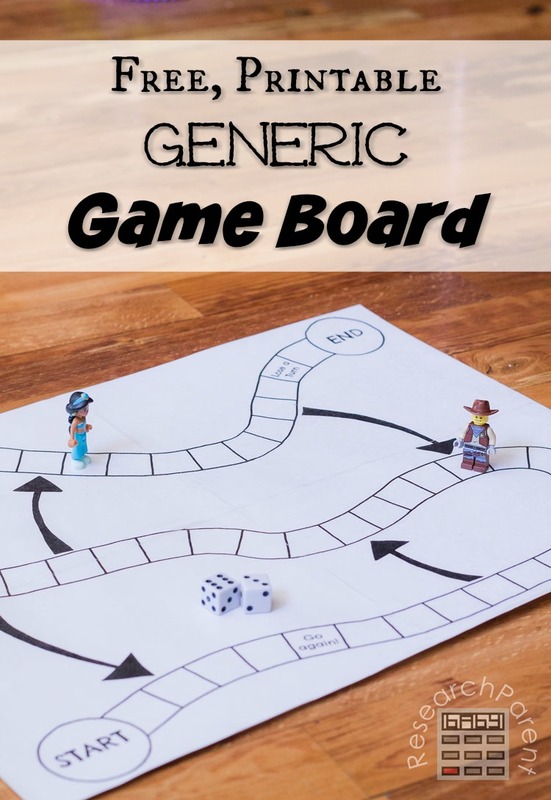 Print the generic board game. 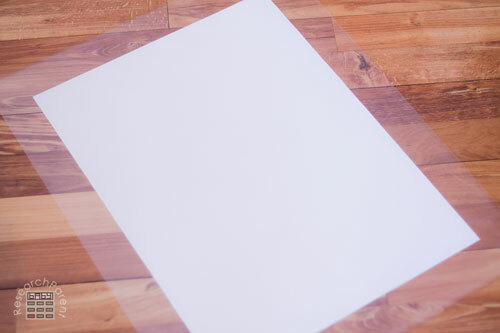 If you want just a 8.5″x11″ game board, just print the last page and you’re done. 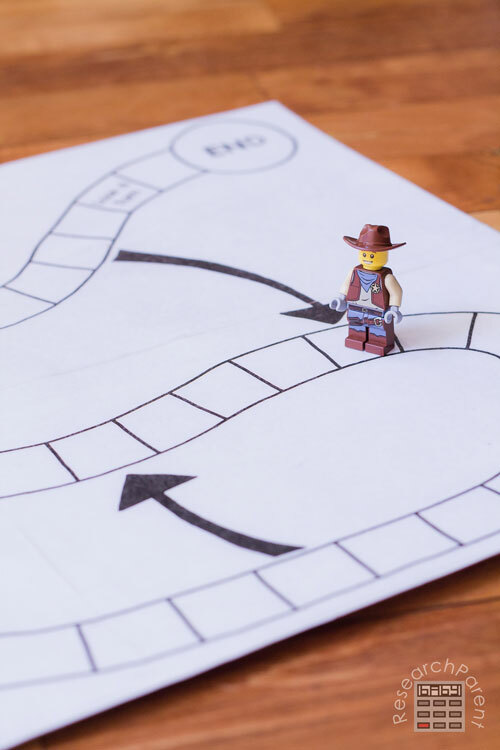 If you want a bigger game board, print pages 1 through 4. 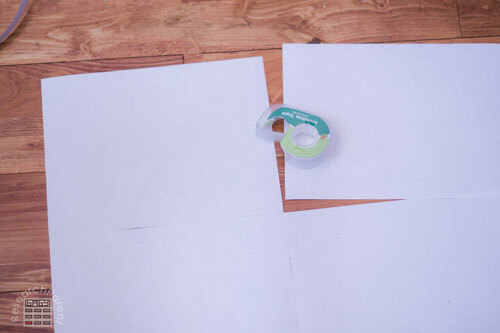 Cut out the borders for all 4 sheets of paper. Flip the pages over, line up the edges, and tape them together. At this point, you could be done if you’re not planning to save your board for a long time. 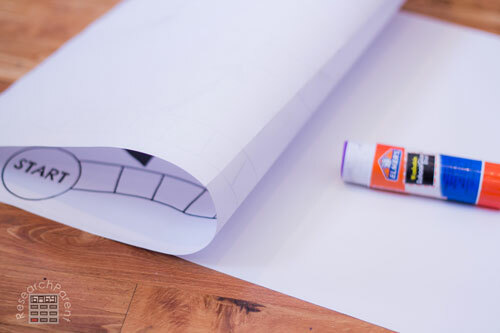 If you’d like your board to be a little more sturdy, find a piece of poster board. Foam board or cardboard could also work. 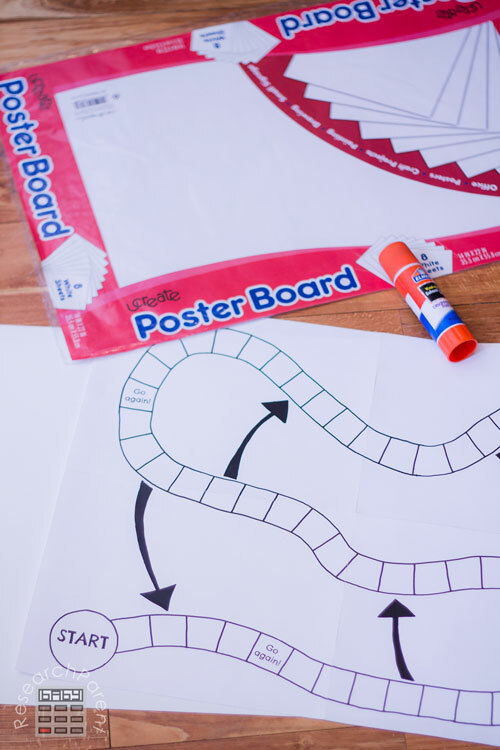 Glue the game board onto the poster board. I found it helpful to glue it down a little section at a time. Note the game board paper hangs off my piece of 14″x22″ poster board, but the entire game board is on the poster board if I center it properly. 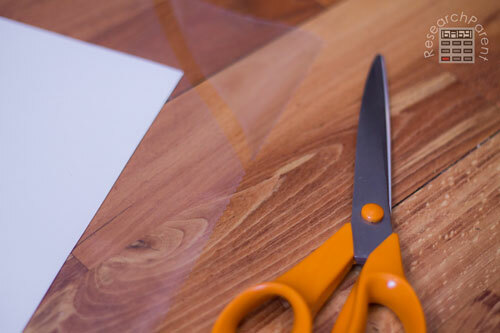 Cut off the excess paper and poster board. Peel off the backing. 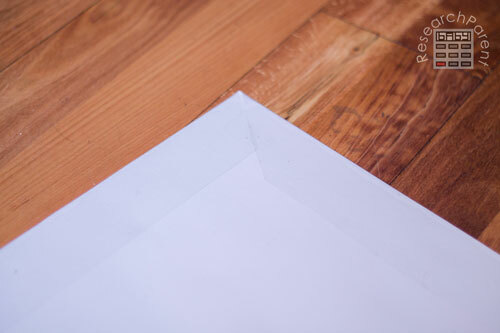 I find it helpful when peeling the paper to tape the corners of one end to the floor. 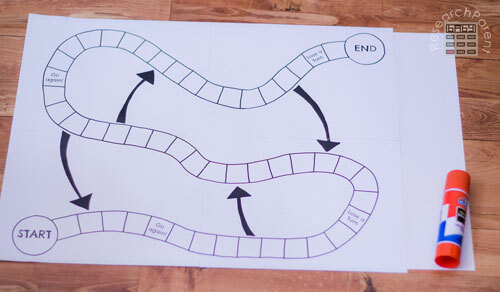 Leave the contact paper on the floor, sticky side up, to ensure it stays flat, then push the game board onto it. 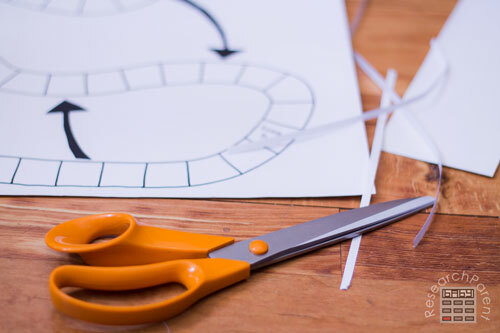 Cut triangles off the corners of the contact paper. 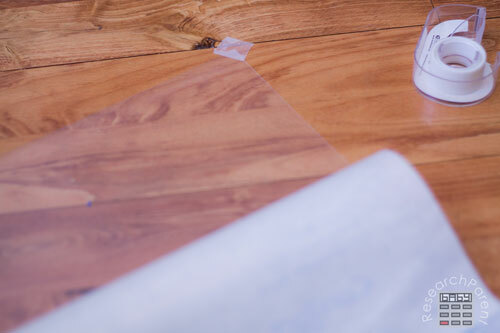 Fold the edges of the contact paper over onto the back side. 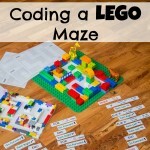 Add some game pieces and dice and you’re ready to play! 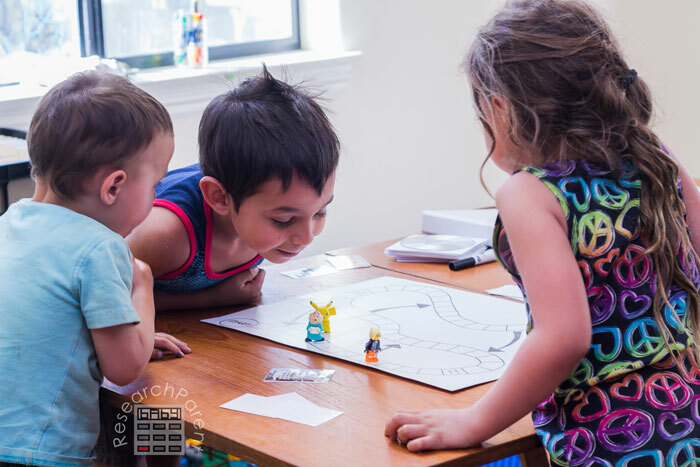 In order to play, you can use the game board as a trivia game with question or clue cards as described above, you could work on spelling words or have the child solve a math problem before each turn, or you could just forgo the questions and play it Chutes and Ladders style. The possibilities are endless. Enjoy! 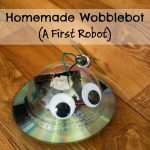 Click here for more Homemade Fun ideas for kids.